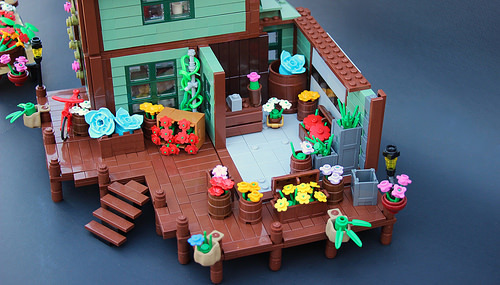 Gabe Umland‘s latest creation is a beautiful LEGO flower shop. The technique used for the clapperboard walls is interesting — 1×1 bricks built sideways and slightly skewed to create a slope effect. It looks great here in sand green, particularly against the brown of the building’s frame and the porch. In fact, one of the things that makes this model appeal is the overall color balance of the image — with the tan of the roof reflected by the little delivery truck. 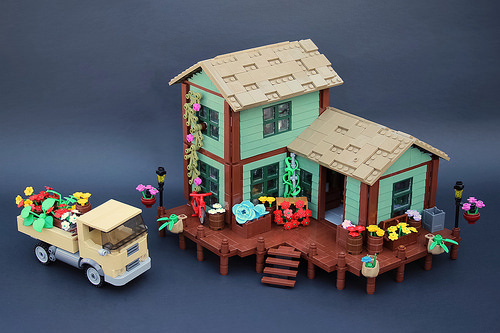 Often LEGO creations can be a riot of color, but sometimes it’s nice to see something a little more restrained. You wouldn’t describe the color scheme here as dull or flat, but it’s certainly classy.